If every office worker used one less staple a day, we could save 120 ton of steel. How mind boggling is that?! 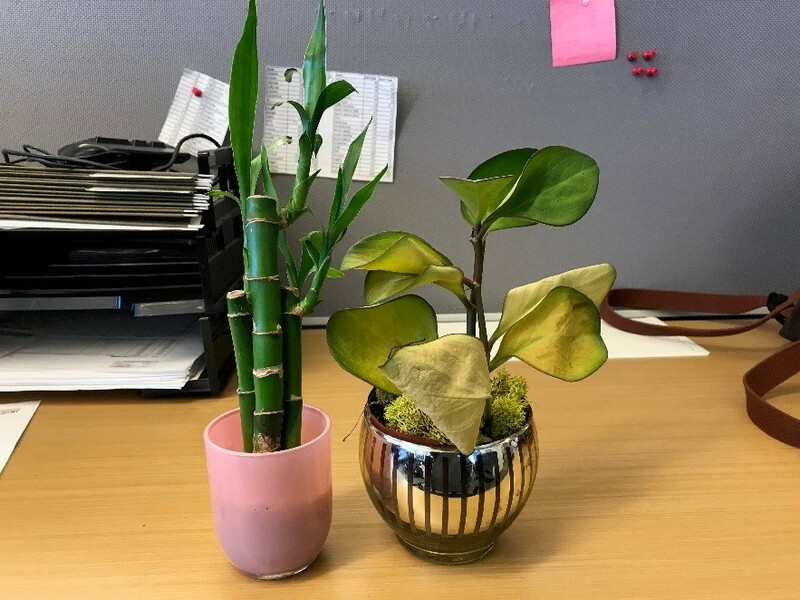 My office plants: Jim and Pam! Adding greenery to your desk is proven to have positive effects on a workspace. Investing in a succulent, mini cacti or a bamboo plant can reduce stress, increase productivity, reduce sickness and most importantly, make your desk look prettier! That’s all great for work efficiency, but what about mother earth? Desk plants are truly the coolest because they help freshen the air! A recent study has found that indoor plans can help reduce carbon dioxide levels by 10 percent in air-conditioned offices and about 25 percent in buildings without air conditioning. Personally, I love my desk plant, I know my coworker loves her desk plant and I highly recommend looking into getting one! Powering down to save up. You’ll never believe this, but the National Resources Defense Council states that, “always-on but inactive devices may cost Americans $19 billion and 50 power plants worth of electricity annually.” Moral of the story – we waste an unfathomable amount of energy by staying plugged in 24/7. Be more environmentally responsible by powering down devices at your desk. If you’re not charging your phone, unplug the charger. If you aren’t using your computer, power it all the way down or put it into sleep mode. These small adjustments to your personal desk space will save a ton of energy in the long run! Can office supplies be eco-friendly? The answer is yes! You can make your desk ultra-eco-friendly by adding the finishing touch of green office supplies. With some research, you can find tons of green office supplies such as biodegradable pens, non-toxic cleaners, biodegradable packaging and even strapless staplers (quick solution to the wasted steel mentioned earlier)! Even by investing in one or two greener desk items, you’ll be helping mother earth more than you realize! This entry was posted in Currently Employed and tagged conservation, earth day, Go Green, go green at the office, Go Green at Work, office efficiency, save the earth. Bookmark the permalink.